People ask me all the time why I went to occupied Palestine-not just once-but 7 times as of June 2009- since 2005 and why do I care so much about such a small plot of real estate. I reply, that I went the first time to meet a little boy of Bethlehem who changed my life and to be the Christian delegate amongst the Palestinian and Jewish co-founders of the Olive Trees foundation for Peace [http://www.olivetreesfoundation.org/] an interfaith non-profit dedicated to raising awareness and funds to purchase trees to replace those that have been destroyed by The Wall. 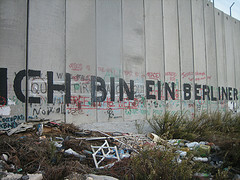 But, my last four trips to occupied Palestine were driven by the fierce urgency of now and a sense of calling; to go-bear witness-and report about the lives of regular people living under military occupation and to learn about and support the grass root efforts of Israeli, Palestinian and International nonviolent activists against the occupation of Palestine. I also left hearth and home for occupied Palestine five times because injustice anywhere reverberates all over the world and American taxpayers are culpable in where their money is laid down. Annually, over 3.2 billion USA tax dollars are sent to Israel to support the now 40 years of military occupation of the indigenous peoples of the Holy Land. It was at an Olive Trees Foundation for Peace meeting, that I met a Catholic woman who showed me a photo first published by the Florida Catholic in 2000; a photo that irrevocably changed my life. Photographer Debbie Hill, captured three year old George [it is his photo that adorns the banner of my website] of Beit Jala, a once peaceful Christian village a five minute car ride from downtown Bethlehem, the morning after the Israeli army destroyed his sanctuary. Israeli forces had retaliated against a few hopeless militants who had infiltrated George's neighborhood to snipe across the way into the illegal settlement/colony of Gilo, about a mile from the top of the hill not far from George's home. The shrapnel that blew apart the wall of George's bedroom read 'Made in USA ' and was delivered via American made Apache helicopters. The second I saw George's eyes, in that photo, my heart said "DO SOMETHING!" What could I possibly do I wondered, but I did make a copy of the photo, put it in a frame and placed it upon the altar [a bar high table] in the upper room of my home. Dozens of times a day, I stop and gaze into the eyes of that little boy of Bethlehem and wonder what it will take to end the insane cycle of violence in the Holy Land; which is in pieces-bantustans. When I met George for the first time in June 2005, I vowed to him that the rest of my life would be dedicated to doing all I could to help bring about the end of the occupation of Palestine. Of course I had no clue as to what I would or could possibly do, or how much of an 'impossible mission' I had promised a little child of Bethlehem. But, every morning I wake up and wonder what I can do today in the pursuit of peace and justice; equal human rights for all, for that is the only way Israel will ever be secure. A month after my first return home from occupied territory, I put up my website and became a civilian journalist; which is best understood as one who goes out of their comfort zone to report for the benefit of we the people, without orders or censorship from editors or paychecks from conglomerates. The first civilian journalist may well have been Rachel Corrie, the altruistic young American and volunteer with ISM/International Solidarity movement who was run over and killed by the weight of a Caterpillar bulldozer in Gaza in 2003, four days before America bombed Baghdad. Rachel and other NONVIOLENT activists had spent hours protesting against the demolition of the home of a pharmacist with five children in Gaza. 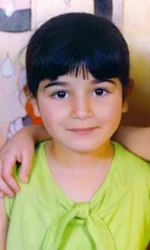 The Corrie family has sought but has yet to receive justice; an open Congressional investigation and admission of accountability by the Caterpillar Company which continues to reap profits from manufacturing products that further the military occupation of Palestine. "Something disturbing about this friendly curiosity. It reminded me of how much, to some degree, we are all kids curious about other kids. Egyptian kids shouting at strange women wandering into the path of tanks. Palestinian kids shot from the tanks when they peak out from behind walls to see what's going on. International kids standing in front of tanks with banners. Israeli kids in the tanks anonymously - occasionally shouting and also occasionally waving - many forced to be here, many just aggressive - shooting into the houses as we wander away…There is a great deal of concern here about the "reoccupation of Gaza". Gaza is reoccupied every day to various extents but I think the fear is that the tanks will enter all the streets and remain here instead of entering some of the streets and then withdrawing after some hours or days to observe and shoot from the edges of the communities. If people aren't already thinking about the consequences of this war for the people of the entire region then I hope you will start." It was the events of THAT DAY we call 9/11 topped off by President Bush's advice a few days later to we the people that we should all go shopping if we wanted to help, that drove my curiosity to learn "about the consequences" of USA foreign policy in the Middle East. Being a Christian, I also was driven by the need to forgive, love and do good to my 'enemies' that led me to connect with the interfaith non-profit OTFFP/Olive Trees Foundation for Peace during the summer of 2003. I connected with the OTFFP after reading two oped's published in the Orlando Sentinel written by the Palestinian Muslim and American Jewish Co-Founders of the OTFFP regarding the need for open dialogue that recognizes, respects and empathizes with the pain of the other; for when that happens, anyone of good will, will be moved by compassion to do something to alleviate the pain of the other. The OTFFP organization united American and Israeli Jews, Christians and Muslims after THAT DAY we call 9/11 to literally extend the olive branch of peace to all the cousins in Father Abraham's family in Israel Palestine by providing the funds to purchase fruit bearing trees on both sides of The Wall. So far, 30,000 have been rooted. After a few phone calls and emails to the OTFFP organization, I committed to attend a Sunday afternoon OTFFP meeting in south Orlando following the final third of my first year of weekend retreats for students in a two year formation program for Spiritual Director's. During 2002-2003, I participated in a central Florida, Episcopal-Methodist Formation Program for SD/Spiritual Director's/SD's. SD's are not counselors or therapists, but are centered and prayerful people who have learned to listen with their hearts to any other speaking of their struggles with God. I knew going into the program that I would NOT be hanging out a shingle as an SD, I was drawn to be there for the curriculum; studying the saints and various ways of prayer. That is also when I began to write creative spiritual literature. But on a Sunday afternoon in the summer of 2003, after concluding my final weekend retreat I attended my first OTFFP meeting and my life was irrevocably changed, and it began that morning during a guided meditation. The workshop leader instructed my class to close our eyes and breathe deep and slow as she invited us to enter into a long corridor with many closed doors; and then, she went silent. Immediately, I imagined myself skipping, jumping, dancing and running past miles of closed doors as I headed to the end of that long corridor. I was aware of, but not interested in any of the closed doors on my right and left. I headed straight ahead although it was a while before I saw the enormous cathedral sized double doors at the very end of the hallway. As I approached the wooden doors they slowly opened into the inner space and I could see trees and mountains. After crossing the threshold, I realized I stood upon a mountain top and I could see for miles. There were people of every color and creed, in diverse dress and all were at rest and in peaceful harmony under those trees. When the workshop leader interrupted my reverie, I did not want to leave that mountain top. I also had no clue if I had a glimpse of heaven or a possibility for this world, but as I was on my way to meet some of the Olive Trees for Peace people I thought that had something to do with my imaginative meditation. I was the first to arrive at Dr. Diab's home for the meeting, and on that Sunday I was the only Christian in a room filled with American Jews and Palestinian Muslims. I was in awe of all of them as I prayed, "Jesus Christ! Will you look at all these Muslims and Jews doing exactly what you commanded your followers must do; forgive, love and bless ones enemies. Imagine when all we Christians do it too!" It was that fateful day that led me to travel two hours every Tuesday afternoon for many months in order to listen and write down Dr. Diab's memoirs, with the intention that it would be for his grandchildren. But, being an Irish story teller, dissident and spiritual creative, I had no control over the six fictional characters that welled up within me and who began to converse with Dr. Diab during the days that followed our Tuesday meetings. Not until I completed, KEEP HOPE ALIVE did I even realize that my 'imaginary friends' also represented six different ways to intuit, love and serve God. 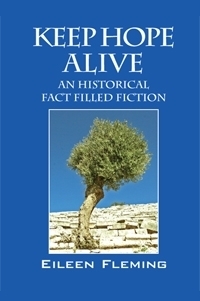 KEEP HOPE ALIVE is also an historical fiction based on the memoirs of a 1948 Palestinian Muslim refugee who became an American citizen with Top Secret Clearance during the Cold War and founded the non-profit interfaith Olive Trees Foundation for Peace as a positive response to THAT DAY we call 9/11. Because of my connection to the OTFFP, I journeyed the first time to occupied territory in June 2005. I wrote down everything I experienced, felt in my gut and wondered about. I went places I had never imagined existed and I did things I never thought I would or could; such as leaving Ramallah for Jerusalem late at night with a driver I did not know and who only spoke Arabic. That morning, I rode along with Dr. Diab and his driver to Ramallah from Jerusalem, and witnessed the Wall in full frontal, brutal view. On my left was a thirty foot high wall of concrete; on my right, only rows of bankrupt businesses. Dr. Diab and I had an appointment at the Palestinian Authority’s compound, where Arafat is now buried. After that meeting, Dr. Diab set off for his home village in the Galilee and I explored Ramallah with a friend who was born and lives there. Just before midnight, my friend walked me through the checkpoint to where the cabs waited. I cringed when I saw the watchtower’s small window lit up, and I considered how easy it would be to be shot at and never see it coming. The ground was rocky, uneven, and littered with debris and the only light was from the moon. My friend bargained with a cabbie in Arabic and I marveled that I, who hated to fly before 9/11 and with absolutely no sense of direction at all, who only speaks and understands English, was traveling alone through occupied territory without any fear at all. After two weeks of traveling through Israel Palestine with ten other Americans connected with the OTFFP, I remained alone in Jerusalem for the following three days and once again, my life was irrevocably changed. 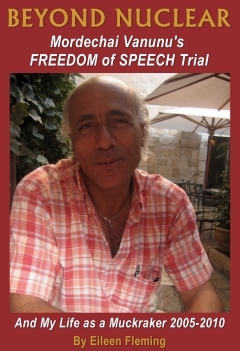 On the third Tuesday in June of 2005- six days before I returned to the USA- after an excruciatingly painful day in Hebron, I crossed paths with Vanunu for the first time. In April 2005, two months before my first trip to Jerusalem, I turned the TV on that had last been tuned onto the History channel. They were broadcasting a show called, "Sexpionage" all about Russian female spies and one from the Mossad. The very first clip that ran before my eyes was of Vanunu being transported to his closed door trial depicting his inspired move to write upon his palm: "HIJACKED" and the Rome flight number he had been on. That was followed by a clip of Shimon Perez in 1986 stating that Israel would never be the first in the Mid East to possess nuclear weapons. I did email Vanunu after that show to thank him for what he had done in 1986 and to let him know that I and nine other Americans would be in his territory in two months and we would like to take him to dinner or lunch. But, just days before that trip, a Palestinian American warned me not to contact Vanunu as Israel had denied him the right to speak to not just foreign media but also ordered him to not speak to any foreigners at all. Only because a friend from Ramallah happened to be in Jerusalem on the third Tuesday in June 2005, and invited me out to dinner, did I venture out again. I had no hunger for food after my day in Hebron but as we walked towards the Old City and neared St. Georges Cathedral where Vanunu had been living, I asked my friend if he knew about Vanunu. He recalled hearing about Vanunu's release from prison in 2004, but he did not know Vanunu was a Christian who had grown up in an Orthodox Jewish home but rejected the faith at 14 years old. As we entered the courtyard, Vanunu was on his way out to a meeting and a few minutes difference and we would have missed him completely. Instead I was startled by his physical presence, for I had imagined Vanunu to be dark eyed and much taller than I at 5'4". Vanunu is not much taller or heavier than I, but what knocked me for a loop were his light green-blue eyes that immediately reminded me of the eyes of an old woman I met in 1998, who irrevocably changed my life. Her name was Bernice and I crossed paths with her for the first time just a few weeks after I began visiting someone at a local nursing home. As I walked down the hallway, Bernice called out, "Help me. Help me." I had been a registered nurse for twenty-five years and when ever I hear someone ask for help, I am compelled to do something, or at least try. All Bernice wanted was for me to change her position, for she was completely paralyzed. From a distance I thought her eyes were dark, but as I approached her, I was startled at how light green-blue they were. That day was the beginning of my now ten year nursing home ministry, and although I have no clue what color Jesus' eyes may have been, in that moment, I sensed/experienced the presence of The Other; that mystery we call God, for lack of a better word. Crossing paths with Bernice was the first time I had known a visceral, intuitive experience of the presence of God within another. It happened for the second time in the courtyard of St. George's Cathedral in 2005, during the chance crossing of paths with Vanunu, who inspired me to do something I had not yet imagined I would or could. During our third meeting, while Vanunu was telling me about growing up in Marrakech, Morocco he asked me if I had ever seen the "Dorothy Day" movie, "The Man who Knew Too Much" for the beginning scenes were shot where he grew up. He meant to say Doris Day, but in that moment I realized my childhood dream of being Brenda Starr had matured, for Vanunu's slip of the tongue was the catalyst for me to begin to imagine following in the footsteps of Dorothy Day, the 20th century socialist bohemian muckraker agnostic who became a Christian Anarchist within the Catholic Church and a voice for the voiceless in her newspaper The Catholic Worker, which persists today. Dorothy Day understood that, "Love is not the starving of whole populations. Love is not the bombardment of open cities. Love is not killing......Our manifesto is the Sermon on the Mount, which means that we will try to be peacemakers." During my travels through occupied Palestine and after listening with my heart to the people who shared their stories with me, I asked everyone, "How can I help? What can I do to try to be a peacemaker?" Everyone responded, "Tell our stories." 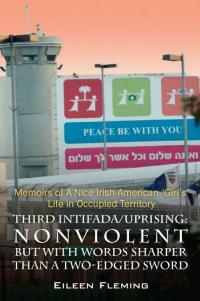 Dorothy Day and Rachel Corrie told the stories of the oppressed. They both are dead, but as long as I can do something and have breath, I too will tell the stories as I try to be a peacemaker by seeking justice; equal human rights for all, and persist to hope for the best.